Rail Loading Control Room for the joint venture between Associated British Ports and the power generation industry, providing terminal investment at the King George Dock – Hull, where a new biomass handling facility is currently under construction. 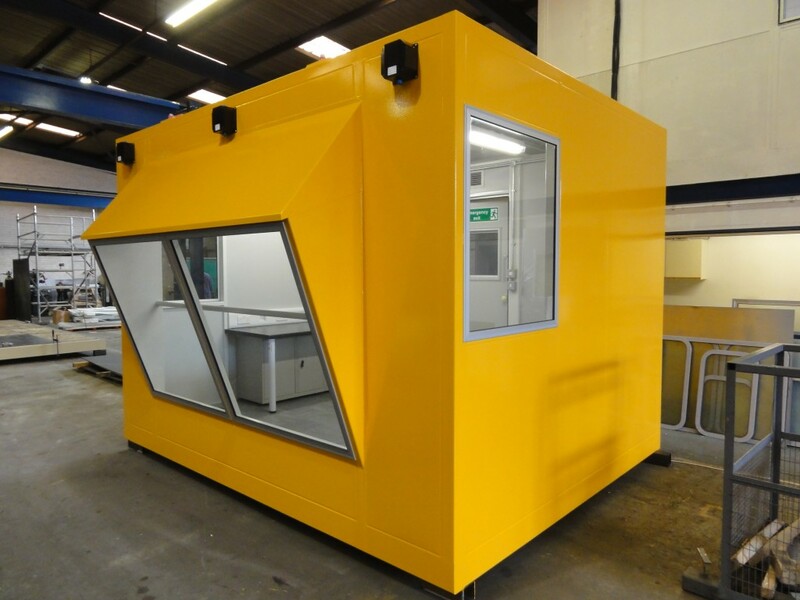 To design, manufacture and deliver the required control room, this being of approximate overall sizes 3.7m long x 2.9m wide x 2.7m high. The control room is to be sited in an area where explosive atmospheres may occur, and in this respect the facility is to be fit for purpose in providing a safe working environment for operations and maintenance personnel. To be installed in an elevated position, the strategically-placed inclined secondary glazed viewing panels allow operational personnel to oversee the rail loading process and view the rail stock entering and leaving the loading facility. Internal & external (and emergency) lighting, power, data transfer, fire detection & alarm etc., (all external electrical equipment to be compliant with the `Explosive Atmospheres Directive – Zone 22′) to be installed. Computer & visual display equipment is to be housed within the facility, and the unit is to provide such equipment with protection against dust, dirt and the harmful effects of condensation, corrosion etc. The end user intends to install a process control console within the facility, and the control room floor required a suitably sized, sealed aperture directly beneath the console to facilitate the installation of the necessary power cables, control wiring etc. All flooring finished in a hard-wearing vinyl tile overlay. A fan-assisted ‘fresh air intake’ ventilation system, filtered to EU7, is to be incorporated at low level (for ease of access, maintenance etc.) and an air conditioning system at high level for heating & cooling – with the condensing units, fans etc. located outside of the hazardous zone. An external noise level of 95dB(A) at 1 metre was reduced to 67dB(A) inside the Control Room, more than satisfying the customer's requirements. We at Spencer’s would like to thank Acoustic Applications for their hard work during this project, not only have you supplied a first class piece of equipment but you have endeavoured to bring the project forward to meet time restraints imposed on site. The quality of the control room is second to none and the project staff were more than accommodating to any requests and variations. We look forward to working with you again on similar projects in the future.